Ed. note: this is Chapter One of our exclusive story about the town of Sterling and its early pioneers, including new information about the naming of the town and the founding fall of Jesse Beriah Ball. At the end of the story you will find the links to the other chapters of the Sterling story. The county histories date the beginning of Sterling as 1878 but there may have been a logging camp there before that. We know from an obituary for Alex Stafford, the famous Sauk teamster, that he moved from Quebec to Washington Territory in 1876 to work for Jesse Beriah Ball, who was logging east of present-day Burlington. Sawmill owners back then bought timber rights to a tract of fir and cedar and then moved on once the area was clear-cut. Winfield Scott Jameson, the famous mill owner and speculator from Port Gamble, originally owned options on most of the timberland area from Sterling to the future site of Sedro. In the future, Sedro would form two miles to the east and Burlington would rise three miles to the west. The town of Sterling started as Ball's Camp, the last stop up the river when sternwheelers were finally able to proceed past the logjams that blocked the bend between future Mount Vernon and Avon for decades. Ball's Camp was the first village on the river east of Mount Vernon, about ten twisting miles from that early city and 30 miles from where the river met Puget Sound. Judging from his answers on various census records, we think that Ball was born in Virginia in about 1830. He apparently moved from there sometime to Missouri. An 1850 St Louis census lists a Jesse Ball, who was living on a flatboat on the river in St Louis with about 20 other young men. His occupation was listed as riverman and he was listed as being 20 years old. Rivers would strike his fancy for the rest of his life. Family members have also found baptism records for a Jesse Ball in St. Louis, so we hope that other descendants can clear up his birth information for us. We know from the History of the Pacific Northwest, Oregon and Washington, Volume II, published in 1889 [hereafter the 1889 History], that Ball crossed the plains in 1853, the year that Washington was declared a territory. He headed for the gold fields in California above Sacramento. Then at Downieville he worked briefly for wages for the last time. From then on out, he was the captain of his own destiny. He prospected and mined for two years, including a stint at Nevada City, California, and then went into the stock business in Oroville, near Chico, for nine years. Since there was a no-fence law in California at the time, he moved to Honey Lake valley to raise stock in that unrestricted territory for three years after that. We suspect that Ball met Jameson during that general time. Our original hunch was reinforced when a descendant of Jameson found our website last year. We now know that Jameson explored the timberland from future Sterling on upriver from the mid-1870s on, perhaps as early as 1873. We also know that both Ball and Jameson were volunteers with a unit of the U.S. Army in 1866 that was called upon to quell an uprising of Modoc Indians in northern California. The Modocs there struck back when white settlers encroached on their historic territory. About that same time, Jameson moved up to Washington Territory and settled at Port Gamble, where he managed timber tracts around his homestead, a few miles south of Pope & Talbot's legendary operation, and built a mill. In 1867 Ball also moved to the Northwest, settling initially at the Nisqually bottoms near Olympia, the territorial capital. Olympia was growing slowly from its beginnings as an Indian village. A few merchants such as Mike Collins and Edmund Sylvester built stores there and incorporated the town in January 1859. After a couple of years in the area, Ball started a logging business, possibly at the urging of Jameson, who had large timber holdings south of there in the Cowlitz area. Census records show that by the mid-1870s, the Ball family resided near Castlenook on Fox Island across from Steilacoom, an island made famous for being Washington governor Dixie Lee Ray's residence a century later. In the 1870s, Jameson bought large tracts from scrip homesteaders [squatters who signed up for government land but did not fulfill all the legal requirements for proving up] in the area that we now know as Sterling and Ball appeared there in 1878. Thurston county records show that Jesse was a good citizen while living there. He regularly served on juries and was an election judge in 1874. Up at Sterling, he established a logging operation that was initially called Ball's Camp and then Ball's Landing after the Mount Vernon log jams were partially cleared in 1878 and steamboats navigated upriver. This map was drawn by the U.S. Army Corps of Engineers in 1897. Disastrous twin floods of 1896 and 1897 followed another earlier in 1894 and the Corps was investigating the possibilities of forcing a new channel of the Skagit river west of Sedro and southeast of old Sterling. You can see on the map that what is now Hart's slough was then the uppermost of a double horseshoe bend of the river. The southern horseshoe looped below Joseph DeBay's farm. After the river itself formed a shallow slough on a straighter course, the Corps dynamited the channel and then the mighty flood of 1921 cut straight through, forming a main channel north of DeBay's farm, forming an island. The southern loop is now a dry slough and DeBay's farm is now a wildlife refuge. In the original version of this story, we asked descendants to provide information about Ball and his family. In August 2001, two of Jesse's great-great-granddaughters, Susan Shoemaker and Sharon Calabrese-Winterburn, found the website and they have been contributing much valuable information since then. Until the sisters found the site, our only information about Jesse came from snippets in a few books. Susan's documents noted that Jesse chose Sterling for his camp and store since it was on the bend of the river and since people could not go further in months of low water. That is especially true of the Sterling bend because there were two riffles there that presented hazards even for the shallow-draft sternwheeler steamboats. A riffle is defined as a rocky shoal or sandbar lying just below the surface of a waterway that causes water currents that endanger navigation. In the late 1870s, before the upriver communities of Lyman, Hamilton and Birdsview grew in population, mail was dropped there. Leonard Halverson, whose family moved to the Sterling area from Fir island in 1917, discovered during his own research that steamboats stopped at the lower riffle and then goods and mail destined for further upriver were portaged overland to Hart's island and then loaded onto canoes bound for the upriver communities. Up until the 1920s the Skagit flowed on a markedly different course, with a double horseshoe bend, the upper horseshoe around Hart's island and the lower one looping more southerly towards the Nookachamps creek. That southern horseshoe is now a dry slough, because the river channel cut through on its present channel, starting in about 1911. The flood of 1921 completed the process and an island was formed and named for settler Joseph DeBay. Halverson showed us on an old 1873 government-map that someone had apparently settled or squatted on the west shore of the northern horseshoe bend north of the upper riffle. 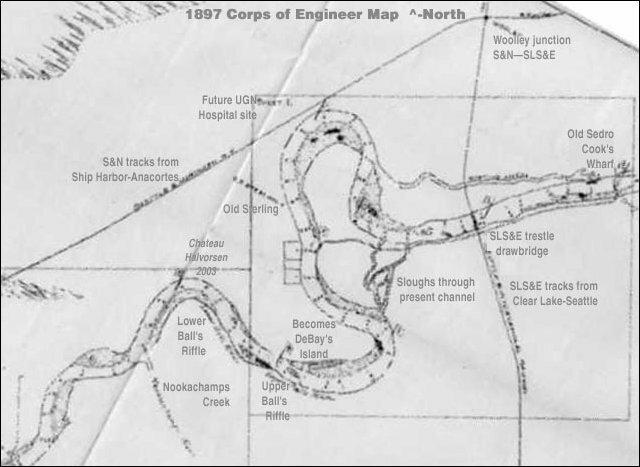 Minkler descendant Mike Aiken has an 1897 Army Corps of Engineers map that places Ball's original camp at that location with the town of Sterling about a quarter of a mile north, also on the riverbank. Halverson recalls that his father told him stories from old settlers that the original town of Sterling was located over towards the lower riffle. The next record of Sterling is from Mrs. Wilhelmine "Minnie" von Pressentin, who joined her husband in Birdsview in January 1878. In 1945, she recalled the three-day canoe trip that her family took upriver. According to Minnie's memoirs, she hired Indians to help her portage around the jams with her five children and household possessions. On the first night they stayed at a point she referred to in her memoirs as "Old Sterling," which may have been Ball's Camp or a point west of there called Lower Ball's Riffle. She recalled that two bachelors named Lafayette Stevens (who discovered the Cokedale coal veins) and a Mr. Williams had built a one-room shake house near the river on the north shore. The bachelors slept upstairs that night and Mrs. Pressentin and her five children slept in the only bed downstairs. Her son, Paul, recalled in 1949 that the shack was made of rough-hewn boards and was reached by steps cut in a log that led from the water's edge to the cabin that had dirt floors. She did not mention the Ball family, so perhaps they moved there later that year. The next record we have of Ball's Camp is from Eliza Van Fleet who arrived here with her husband Emmett and daughter Eva in late May 1880. When they stopped at what she called "Ball's Camp," Eliza was quite taken with Ball's daughter, Mrs. Emma Welch, who joined her father at the camp a year before on April 16, 1879. Eliza says in her memoirs that Emma had just discovered that she was pregnant for the first time. Emma's daughter, Ida, was born on Nov. 23, 1880, often noted as the "first white child" born in the river area east of Mount Vernon. It was a custom to record the birth of the first white child in each frontier village, but there is disagreement among Ball descendants about whether Jesse's first wife was Caucasian. Mixed race was rarely mentioned in frontier journals, and the only time Emma referred to her race was in a 1972 article that we reference later and she called herself a "white woman." One Ball descendant infers from a photo of Henrietta, along with Emma as an infant, that Henrietta was of mixed race. She suggests that Emma could have been of Melungeon descendant. Melungeons are descendants of Portuguese from Virginia who moved to Tennessee and other border states and intermarried with both Indians and Blacks. [For more information on Melungeons, see this website] Other Ball descendants question that inference. We have no way of telling what Henrietta's racial makeup was, although we are still researching California census records, which did indicate racial background. No one in the family objects to such background; they only object to the assumption made from the photograph. Ray Jordan wrote an article about old Sterling in the Skagit Valley Herald on Aug. 16, 1972, where he quoted an undated interview that Emma gave to an unknown newspaper reporter decades before. That article supplied some of the information above about Jesse's early times in Washington. Emma said that she was born in Oroville on Jan. 15, 1862. She remembered coming to Washington Territory at age five (in 1867) in a covered wagon with her father and two brothers. She said they first settled on the Skookumchuck river near Centralia and then at Nisqually before coming to Sterling permanently in June 1878. Her mother died in California when Emma was just two years old. We imagine that she acquired some steeliness as she grew up in the outback with only her father and brothers around. Emma arrives on the ill-fated sternwheeler Josephine Emma arrived in Sterling on April 16, 1879, on the sternwheeler Josephine after attending a Catholic school down south in Pierce county. The 1889 History notes that Ball owned the boat as a partner. We do not know the other owners but Emma said that the captain was a Mr. Smith. According to Helen Barrett's terrific, out-of-print book, Sternwheelers and the Skagit River, that would be A.L. Smith. The same source called the boat the "ill-fated Josephine" and you will soon see why. Ball was not the first owner of the steamboat and we are not sure when he bought into it. Judging from the influx of settlers and the heavy river traffic, Ball's investment in the Josephine in 1879 looks like a very wise one. In the 1906 Illustrated History of Skagit and Snohomish Counties, we learn [on page 120] that in 1879 the Northern Pacific [NP] railroad lost their claim to odd-numbered sections of land in the counties of Snohomish, Whatcom [Skagit was still the southern half of Whatcom county at that time], Island, Jefferson and part of King county. Since the company had not fulfilled all their obligations, that vast acreage was restored to public domain and its sale led to an investment boom that helped the Northwest recover from the effects of the 1873 financial panic that was precipitated by Jay Cooke and the NP. "The lands were rendered subject to preemption at the rate of $1.25 per acre, except in the case of timber, coal or mining lands already fixed at a higher rate." The pot was made even sweeter when the federal government made a rebate of the same amount to those who had purchased railroad lands at $2.50 before the effective date of Sept. 1, 1879. Emma arrived along with a party of dignitaries from all over the state and Jesse showed off for them. The passengers included C. Dodge of the firm of Ebey & Company of Seattle, Thomas Prosch of the Seattle Post-Intelligencer [P-I], along with a group of argonauts who were heading upriver to follow the latest gold craze at the Ruby Creek region at the Skagit river gorge in the Cascades. The miners group included Alonzo Low, who earlier opened the first commercial establishment in future Skagit county in 1867, a general store at LaConner on the east side of Swinomish slough. Low's father, John, was one of the original party that landed at Alki Point in September 1851, the landing that marks the beginning of Seattle. Others included Albert Bacon, whose impact on the gold fields was so important that a major stream near Newhalem is named for him. Also in the group was August Graham, whose father, Orlando Graham, was been a member of an 1873 party with Lafayette Stevens and Amasa Pegleg Everett that discovered the coal in the mountains across the river from future Hamilton. A channel had been cut through the last logjam at Mount Vernon and the Josephine had four points of landing after entering Steamboat slough at the mouth of the south fork of the Skagit: Mann's Landing, now Fir/Conway; Skagit City, near the meeting of the tines of the fork; Mount Vernon, and Ball's Landing. Captain Smith stopped at Jesse's place for the night. We wish the P-I reporter had noted where everyone on the passenger list of 20 slept that night. There is no record of a hotel, at least not in 1879, but we know from an article in the March 18, 1884, Skagit News, that an A.H. Lindstedt operated the Sterling Hotel near the landing. . . .a distressing accident occurred, casting a gloom over what was expected to be one of the most happy events of the season. James H. Armstrong, while sitting insecurely upon the upper deck of the steamer, fell in some manner into the swift and icy current and was drowned. Every effort was made to rescue him, but such was the swiftness of the current that the boats which were launched were upset . . . The river just swallowed him up. The sternwheelers carried staples, lumber and household goods upriver as well as passengers. On the return trip, they carried vegetables, hay and fruit for markets downriver and in Seattle. Settlers often made the only cash of the year by chopping cord word and stacking it on the bank for the sternwheeler captains to feed their hungry boilers. The gold rush continued through 1880, the year of the worst snow ever in the recorded history of the valley and also of the following high water through that summer that a total of six sternwheelers plied the river current as far up as future Marblemount. Barrett noted that the Josephine and the tug, the Gem, both built in 1878, were starting a four-year prosperous run for their owners. 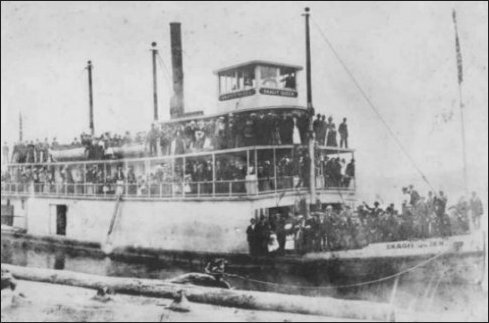 She described the Josephine and another sternwheeler, the Chehalis, as making excursions that year as far as The Dalles at Concrete with prospective miners and farmers. Both were rated at 100 tons capacity. The fare all the way up the river from Mount Vernon in those heady gold-rush days ranged from $8 to $12. The Skagit Queen was the new class of sternwheeler that replaced the ill-fated Josephine. It was about the same capacity. Even after the gold rush subsided, sternwheeler owners were making good profits over the next three years. But by 1883, the wheels were coming off the wagon, if you will pardon a mixed metaphor. The Gem, loaded with hay, burned and sank in deep water after carelessness on the part of the crew. As noted above, the Fanny Lake hit a rock near Dead Man's Riffle, burned at water's edge within sight of the Ball community and sank, raised later at great expense. The year 1883 dawned with Captain Robert Bailey at the helm of the Josephine. On January 16, 1883, he shoved off from Sterling downriver. Mr. Ball himself had been expecting to go on that very trip, but was deterred by some ominous foreboding, according to the 1889 History. The boat was plying the saltwater channel of Puget Sound at Port Susan between Camano Island in Island County and the mainland in Snohomish County. All of a sudden there was a tremendous explosion; parts of the boat blew up & flew in two directions. The pilothouse and deckhouse went straight up and the rest of the boiler went down, taking most of her bottom along. The hold was full of wood, keeping the shattered hull afloat, bottom up, as Barrett described the damage. Eight of the crew and passengers died. Amazingly, the boat was rebuilt after the Polly steamboat towed her into at Tulalip Bay where she was righted, patched, pumped out and rebuilt. Ball and the other owners were sued, and then they sued the original owner, who had installed a defective boiler before he sold it. By the way, for those of you who love geography, we thank the Northwest Room at the Tacoma Library and the Place Names website for telling us that why that location was so named. "On June 4, 1792, the channel was named by Capt. George Vancouver for Susanna, wife of Rear Admiral Sir Alan Gardner, RN. Admiral Gardner had recommended Captain Vancouver to command the Flotilla to explore the Pacific Northwest. [Edmund Meany, Vancouver's Voyages, p. 110]. 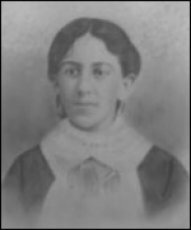 We are going to profile Emma Ball Welch next because we know a lot more about her and because she was such an important woman in the upriver region, as Mrs. Van Fleet noted. But first, we will finish up with what we know about Jesse. Partnership with Byron Barlow and sale to Skagit Railway The wreck of the Josephine seemed to take a lot of wind out of Jesse's sails. In April 1884 he became a partner in the Ball & Ledger general store in Mount Vernon and they also invested in property on the west bank of the river that became known as the Ball & Ledger addition to Mount Vernon. Back at Sterling, he took on a partner named Byron Barlow, so the business became known as Ball & Barlow Co. Barlow migrated West from Michigan to Cowlitz county, Washington territory, in 1853, the year that the territory split off from Oregon territory. During the civil war, he enlisted in the U.S. Army and was commissioned a lieutenant in the Oregon Volunteers, which were then assigned to battle the Modoc tribe in California. As we noted earlier, that is apparently where Ball, Jameson and Barlow met. 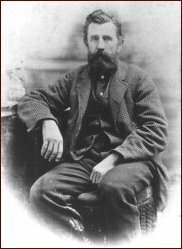 As Ball became a pioneer logger in Washington territory, Barlow became the subagent and "farmer" at the Puyallup Indian Reservation, was elected to the territorial legislature, opened a meat market in Tacoma and then created the Tacoma Trading company. Sometime in the early 1880s, he invested in Ball's logging operation at Sterling. Maybe they began as partners in a steamboat, because in 1887, he became a partner in Pacific Navigation, which became a competitor in the sternwheeler traffic between Seattle and Tacoma and northern Puget sound. We are still searching for a connection between Byron and M.Q. Barlow, the siting engineer for the Monte Cristo Railroad who is the namesake of Barlow Pass in Snohomish county near the old mines. Byron's drydock company in Bremerton launched the famous Skagit Chief in 1893. In 1886, Ball and Barlow sold their logging operation and the store at Sterling to the Skagit Railway & Timber Co. [also in some records as Skagit Railway & Lumber Co.], which was actually a logging outfit that was backed by Northern Pacific investors, whose headquarters was in Tacoma. The new partners may have envisioned a railroad but it turned out to be a paper one. We know from the obituary of Mrs. Catherine Perrault that she and her husband ran the store at Sterling in 1886 before they moved up to Sauk City. That same obituary muddies the date waters because it noted that Skagit Railway owned the lumber camp in 1884. But we suspect someone's memory was faulty in this case, because one of Emma's children was born at the camp in 1885 and her family did not move to Whatcom county until after that move. LaConner researcher Tom Robinson has discovered that there were six investors in the company, including Paul Polson, LaConner merchant and saloon owner, who became president of the company, which then was platting the "Railroad Addition" to Mount Vernon. At that time, anti-saloon interests, led by Leroy Carter of the Puget Sound Mail, were fighting against Polson in LaConner and Polson apparently joined with Tacoma interests to take over the Sterling store and Ball's old timberlands. The company's headquarters was in Tacoma, so the partners may have been affiliated with Northern Pacific Railroad, hence the "Railway" in the name. By 1889, Sedro-founder Mortimer Cook either owned or leased the Sterling store, selling Conestoga wagons along with hardware and grocery goods. In June that year, Emerson Hammer became clerk and then manager of the store after arriving with his bride, Isabel, from Lincoln, Kansas. Cook paid more attention to his farm a few miles north at Olympia Marsh; he sold his Sedro mill the year before. We discovered in an April 1890 issue of the Skagit News that Cook closed out the store at Ball's original site and moved it up to the depot that was set up that year for the new Seattle & Northern Railroad line. The depot was someplace across from where you turn off Hwy. 20 to United General Hospital today. Freight trains still travel on those same tracks. In 1887, Ball filed for divorce and custody of the children by his Indian wife, but later dropped the action. He owned land in West Mount Vernon [Ball & Ledger addition], as well as Fox Island, Point Defiance, downtown Tacoma — maybe in conjunction with Barlow, and Vancouver, BC. 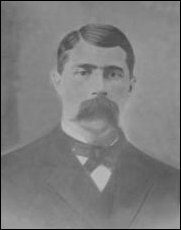 Pam Taylor, another Ball descendant, found his burial place in Seattle, and a monument there gives his death date as February 5, 1889. That monument gives his age as 62, which moves his birth year back to at least 1827, three years earlier than most accounts. Ms. Norris also found records that show that Jesse died in a "pest house" [quarantined apparently because of tuberculosis] in Seattle and is buried at the Odd Fellows cemetery at the Mt Pleasant Cemetery on Queen Anne Hill. Although his original Sterling site is under the Skagit river now, Jesse's lasting legacy is Ball street, a block to the east from the author's house. The city library was placed at the junction of Pacific and Ball streets when the Carnegie library was torn down. Emma Ball Welch. We thought at first that this was her wedding dress but Emma's descendant June Hendy checked the back of the photo and discovered that it is not. Emma signed the photo at age 15. We have found the obituaries for both Emma Welch and her daughter. Emma died in August 1940 at Abbotsford, B.C., about 40 miles southeast of Vancouver. Emma had two older brothers, Warren and David, who worked with their father in the logging camp down south, and continued in Sterling with him. The 1972 Jordan article quoted Emma's memory about the sad story of David's demise. David and five other men drowned on April 26, 1880, at the farthest upriver point of navigation on the Skagit called The Portage near present-day Newhalem. Their canoe overturned while returning from the Ruby Creek gold mines. Six men survived including the only Indian who aided some of the others. Emma, David and Warren were born to Jesse's first wife, Henrietta, who was apparently from Missouri. Her maiden surname is spelled three different ways in various records: Polly, Polley and Pauley. Wives on the frontier led a very tough life back then, especially those who tried to raise their family in near wilderness while their husbands were off raising cattle and fighting Indians. The first record about her shows that was running a ranch with her brothers in the Oroville area. Jesse and Henrietta married sometime before 1860. She was in the 1860 census there with their first child, Jesse Jr. As we noted above, Jesse was a widower when he moved his children north to the Puget sound in 1867. After they moved again, to Sterling in 1878, Jesse remarried. We learned the basics of that second marriage when we read the obituary of Ida Welch McRae Galarneau, Emma's first daughter, who died on March 6, 1938, before her mother died. Ida was the grandmother of Susan Shoemaker and Sharon Calabrese-Winterburn. Their mother, Florence Mona McRae, has kept many records that are valuable for this story. From Ida's obituary we learn that Ball's second wife was an Indian widow named Caroline Lisk, who also died in 1938. 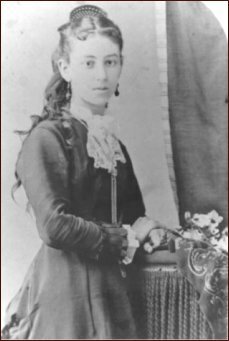 She was born in Coupeville and had two children by her first husband, Joe (occasionally mistaken as William) Lisk, who homesteaded near the village of Fir, on the south fork of the Skagit, in 1873 or before. We recently read issues of Eldridge Morse's The Northern Star from June 1877 and discovered that Caroline bore Joe Lisk a daughter on May 13, 1877. Joe must have died sometime in the last half of 1877 or in 1878. The 1963 obituary of that child, Mary Ann, included details of Jesse's second family. Mary was a baby when her mother married Jesse and the family lived together at future Sterling. The story notes that sometime after Jesse sold the camp and store in 1886 he moved the family back to the old Fir home, which was still standing in 1963 and was scheduled to be razed. Jesse and Caroline apparently married in 1878, about the time that he started his logging camp, and had three children together, according to Pam Taylor's research in the Washington regional archives in Fairhaven: Anthony in 1879, Julia (maybe nicknamed Zula) in 1881 and Kate in 1885; Kate died while still an infant. In the 1887 Washington territorial census, Zulu is listed as age six and Kate is listed as age 2. According to the late historian John F. Conrad, Mary Ann married a descendant of the family of Charles Mann, who was the namesake of Mann's Landing, the steamboat stop that became Fir. Jesse's probate papers provided for Caroline's two surviving children. Jesse's loneliness after his wife's death in 1864 must have been crushing at times, especially in these dreary winters. European wives were few and far between in those days and he chose to marry an Indian, as did many of his neighbors. Susan Shoemaker tells us that some in the family avoided Caroline but Emma visited her often. Emma also showed fascination with the Indian culture in the 1972 Jordan article. As you can see from Emma's photos, she was a beautiful, tall, slim woman with cascading auburn hair and lovely, intense eyes. Albion Welch was working at Jesse's camp when Emma arrived on April 16, 1879, at age 17. He must have been immediately smitten when she walked down the gangplank, especially if she was wearing the dress in the accompanying photo. Jesse originally left her behind to finish high school at a Catholic school someplace in Pierce county. Susan Shoemaker found Catholic Seattle-diocese records showing that Jesse paid good money for his daughter's education. She initially attended St. Joseph's School in Steilacoom for grade school. In June 1875, Jesse paid $99.16, a large sum in those days. That school closed down in the fall of 1875. Most of the students and their families then moved to Tacoma. Susan also found at the diocese a record that may explain where Emma lived or attended school after 1875: "In the spring of 1876, the sisters opened a new school in Cowlitz County ( near present-day Toledo), and it is possible that some of the students transferred to the new school. However, we do not have any student records for that institution." She learned to write stories, songs and poetry, sew needlework and paint with oils, a talent that she exercised for most of the rest of her life. Emma told Ray Jordan for his 1972 article, "I was the first white woman to settle in vicinity. I married Albion Welch [on] Oct. 25, 1879." B.N.L. Davis, the Baptist minister and hop grower from Riverside, performed the ceremony at the first wedding in this part of county. Ida was born on Nov. 23, 1880, apparently at the old farm near Fir, the former Mann's Landing, south of Mount Vernon. We cannot imagine that Emma would have braved a two-day steamboat trip so near to term and we are puzzled why she would have gone so far to give birth when David Batey's new wife moved to a house a mile away from Ball's Landing that summer. Georgiana Batey was the first university-trained woman doctor in the Territory. We can only conclude that maybe Caroline Lisk Ball, Emma's stepmother, lived at Fir with her younger children during parts of the year and that Emma went to live with her during the late stages of her pregnancy. Albion Welch's family from Maine Albion Forest Welch was born in Augusta, Kennebec County, Maine, in 1849. So, at age 30, he was apparently ready to settle down. His father, Philip Hubbard Welch, was bitten by the gold bug and lit out for California around the time of Albion's birth and his son didn't see him for twenty years. Philip Sr. took his oldest son with him out west, Philip Jr., age 12. They braved a five-month trip around Cape Horn that would make most experienced sailors think twice about their profession. We know the details of the trip to Eldorado because one of the younger boys, Albion's older brother Charles Edwin Welch, told the story to the authors of an 1890 volume called A History of Stanislaus County in California. Father and son proceeded up the Sacramento river to Columbia in Tuolumne County, where he $15,000 in a short period, but he made the mistake of deposited his new-found fortune with Adams & Co., a firm that soon failed; they lost most of their gain. This information was discovered by Robert E Williams, a descendant of one of Albion's brothers, George Washington Welch. Back home in Maine, Philip's wife, Delia Lee Welch, was coping with three small boys, all under age ten, in Portland, Maine, where the winters make ours look like balmy Hawaii. She had seven children by Philip but two girls died as infants. Philip wrote back to Delia to sell their property and bring the children out to join him but she could not raise enough for the journey. Charles explains that for the next five years he gave his mother "no peace until she consented to let me go in advance to my father." At age 14 he chose to board a ship in 1854 that would sail west to the Isthmus of Panama, where the jungle was being cleared for the railroad that would cross the narrow strip of land the next year. He road a frisky young colt for the final 12 miles lying between Lake Nicaragua and the Pacific ocean, assisted by a native woman who guided him so that he reached a hotel on the western terminus before the rest of his party. The argonauts all boarded the steamer Uncle Sam the next morning and arrived in San Francisco on Dec. 9, just 23 days out of New York. After slogging through the mud for several days, he joined his father and brother at Sonora. Eager to make a strike, he worked on a hydraulic gold operation at Stevens Bar near Tuolumne. Over the next few years he worked as a vaquero and farmed in California and raised a family there. Sometime between 1854 and 1860 Delia took her remaining children to their uncle Bray Welch in Athens, Maine. She may have been terminally ill because she appears to have died in 1861 at age 50. Two of these boys, Albion Forest Welch and George Washington Welch are in the 1860 census in Bray's household. George Washington Welch joined the Union Army [in the Civil War] and wound up out here three decades later. Another son, Benjamin Franklin Welch, was a deserter in that war and never came here, as far as we know. Delia may have been terminally ill because she appears to have died in 1861 at age 50. George and Benjamin's service is not the family's only connection with the Civil War. 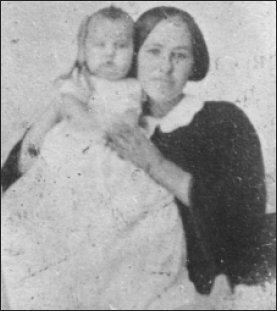 According to family tales, Delia Lee Welch was either a cousin, niece or sister of Robert E. Lee, but the descendants are still searching for the exact connection. Family oral tradition indicates that she was banished from the family for marrying Philip. If they suspected him of being a poor provider, they were certainly right. After Albion finished an undetermined amount of school, he logged in Maine and Pennsylvania and then followed his father in 1870, meeting up with him in Stanislaus county, California, where Charles lived on a homestead with his family. Two years later, in the autumn of 1872, Albion moved to Whatcom county, which still included future Skagit county as its southern half. We do not know when he went to work for Jesse Ball. According to the 1880 Whatcom county census for the Sterling area, Albion and Emma were living in an adjacent dwelling to Jesse's. Although giving birth and caring for her many children took much of her time, she was often at the counter of her father's store near the steamboat landing. Judging from the 1972 Jordan article, she enjoyed that immensely. A keen observer, Emma noted the news of the early day. For instance, she remembered that the first team of horses she saw after she came belonged to a Mr. Roach at Hamilton. They were dapple-greys and came through on a sternwheeler about the first of December, 1880. From there they were led up over a crude trail through the forests north of the river and the wagon was taken apart and carried up by some means that she did not explain. She listed the sternwheelers that came upriver during her time there, including the Fanny Lake, Josephine, Chehalis and the Fanny Lake, which burned at the water's edge between old Sterling and Dead Man's Riffle near future Sedro. She also closely observed the Indians living in the area. At one time, she saw a number of Indians teaching small boys to swim. They stood in circle of shallow water and threw boy into the center time after time until the youngsters finally learned. She was fascinated with how the Indian women cooked meat in cedar root baskets woven so tightly they would hold water. They heated rocks in a campfire and then dropped the hot rocks into a stew, which they boiled vigorously. After the boiling stopped the first rock was fished out with sticks and they tossed another hot rock in, repeating those motions until the stew was cooked. She also noted that they barbecued, a skill that was taught to early settlers in the area. She noted with amazement that on one cold winter day in when snow was on the ground, an Indian family came into her father's store and one small boy was wearing nothing but a shirt much too large, almost to his knees. Emma noted that his feet were bare despite the cold and that instead of buying clothes or shoes, the Indian father bought his son a huge cap that flapped over his ears. "The boy walked out of the store proud as peacock, munching on hardtack," Emma remembered. 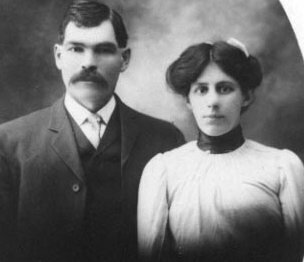 Emma gave birth to her fourth child, Paul Russel Welch, on April 2, 1885, in Sterling, and her fifth child, Jesse Beriah Welch, was born on Nov. 16, 1886, in Nooksack, Whatcom county, twelve miles northeast of present Bellingham. That was a town near its namesake river in Whatcom county that was platted on Sept. 16, 1885, by W.R. Moultray, near the famous spot on the Nooksack river that was known to very old timers as "The Crossing." So we know that she and Albion moved sometime between those dates. This coincides with the time that Skagit Railway & Lumber Co. bought the store and timberland at Sterling. Jesse was very generous to the couple when they claimed their homestead near the town of Nooksack, which was platted on Sept. 16, 1885, by W.R. Moultray, near the famous spot on the Nooksack river that was known to very old timers as The Crossing. The house they built on their homestead also doubled as a store that they called the Fairview. Their first eight years there were apparently prosperous and the homestead is described as being beautiful and growing by leaps and bounds. They would eventually have seven more children there for a total of 11. Albion seems to have been a generous sort, too, as he sold part of his homestead for the community cemetery on Breckinridge road. We discovered that information from James Berg, who researches history of Whatcom county. His great-grandfather and other settlers bought the cemetery site from the Welches on Dec. 24, 1886. James has not yet found references to Fairview, but he notes that the Welch home was the first school house before a new school was built around 1890. The photo of Albion with his children is on the porch of that combination store/home. While prosperous times still reigned, Albion's ranch became a magnet as the far-flung Welch family reunited. Sometime in the early 1890s, Albion's older brother, George Washington Welch, joined them. He and his wife had twelve children while moving across country, and lived most recently in Kansas for about 15 years. Albion's cousin, Lafayette Welch, the son of Al's guardian, Uncle Bray, also came. By 1880, wandering Philip Welch Sr. also joined them at Nooksack, and seems to have enjoyed his grandfather role to the many children. He died there in 1888 at age 76. All those relatives are buried in the family plot. Then, after the eighth year, the roof fell in. Like the Sedro-Sterling area, Whatcom county was booming with railroad investment in the time from 1888-1891. Albion heard the talk that Great Northern would soon choose Fairhaven (now south Bellingham, the town that was then called Whatcom) as the western terminus for its transcontinental railroad line. He decided to mortgage his home and land to buy more real estate in the path of the railway roadbed. In 1893, the Northwest discovered that James J. Hill of Great Northern had been playing everyone for suckers except for the city fathers of Seattle, who had the upper terminus hand all the time. Investors such as Albion were hit by a double whammy when the Financial Panic of 1893 hit at the same time. One after another, prosperous ranchers throughout the Northwest lost their land as their bank loans were foreclosed. Albion moves the family to British Columbia By 1895-96, Albion lost his homestead and investment property and the future was looking bleak. One of Emma's younger sons was named Philip Hubbard Welch for his grandfather. In an undated letter, he described how Albion got caught in the investment boom and bust: ". . . in April 1896 he moved his family, a team of horses, some 9 or 10 cows and a pig or two and homesteaded in B.C. and there they lived until his death." Ida would have been 16 then, so her coming-out years must have been brutal, but she married John Malcolm McRae in 1898 in Abbotsford, B.C. Archie was Florence's big brother. He was born on November 30, 1900 and died on April 14. 1918. Ida and John McRae's son Archie ran away and joined the US army before the family moved back to Whatcom County because he had not succeeded in enlisting in Canada. When they found out that he was underage they shipped him home and he became ill with Swine Flu and died of pneumonia on the boat. His body was shipped to the home of one George Washington Welch's (Albion's brother) daughters in Nooksack. The body was put in the parlor, and Florence who was five, was made to go say farewell. She says that the Swine Flu turned him black and she was certain that this was not her beloved brother and that someone had played a dirty trick. She never got over it. In order to collect money from the US government because of Archie's death while enlisted, the family immigrated back to the US on October 15, 1918. Ida and John eventually divorced after having nine children. She married again in 1931 to Eli Galarneau. The couple moved together to Oroville, California, where she died in 1938 after suffering severe arthritis. Ida is buried in Oroville in a separate cemetery near her grandmother, Henrietta Ball. Emma died in Abbottsford, B.C., in 1940 and upriver Skagit pioneers showed their respect for this fine woman. According to her obituary, four of her peers from Sedro-Woolley attended the funeral : Susie Osterman Alverson, Mrs. Kate Bovey Shrewsbury, Mrs. Eva Van Fleet Beebe and Mrs. Ethel Van Fleet Harris. Emma and Albion are buried together at the Hazelwood Cemetery in Abbotsford, BC. More resources about Ball and Sterling Also see these features about Sterling and its settlers. Some are from our old website and the links will not work. Please return here for links. These stories that started on our old website in 2001 are being updated with new information from our research and from readers and will be completely updated in 2005. We hope that readers will help us with memories and copies of documents photos. You can also read about Jesse Beriah Ball's early days of logging at Steilacoom. Early days of Sterling, the village at the river. We need your help. Can you add to our introductory list of families who settled at Sterling by the river or DeBay Island before 1929? This part is far from complete. We will add to this chapter as readers provide us more information. Chapter 3: Joseph DeBay, the Italian immigrant who grew vegetables for the valley and then saw his farm turn into DeBay Island. 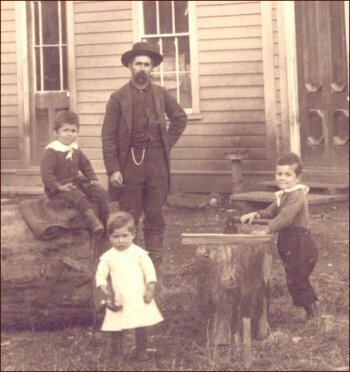 Joseph DeBay, a photo page of the family of the Italian immigrant who grew vegetables for the valley and then saw his farm turn into DeBay Island. We hope that readers will send us their own family memories and photos scans for stories of more early Sterling families. Chapter 5: Schools at Sterling from 1883-1940, with new information supplied by Jeanie Bond, a descendant of the Dreyer family of Sterling. We have been researching Sterling, the earliest upriver town, for 12 years now, and we plan several more chapters about it. We hope that those of you who are descendants of Sterling families or who are researchers will share your family memories and discoveries with us. Copies of documents and scans of photos are fine. We do not need or ask for your originals, which should be kept as either family keepsakes or donated to museums or libraries that will both preserve them and make them available to researchers. Thanks for your help. This story has been updated several times, after we found new information or descendants contributed research or corrected our mistakes. When we first presented our material in 2001, there was hardly any accurate information posted anywhere about Jesse Beriah Ball and his hardy family. It is a testament to the importance of the World Wide Web that many different sources can pool their family memories, documents and photos. We thank all members of this family for their contributions. Our next project is to profile other early Sterling pioneers, including Henry Holtcamp, the Kimsey family, John Egelkrout, Alonzo Salathial Collins, the Ritchford/Richford family and many others. Can you help?.